• How do the definitions of sepsis affect treatment decisions – and CMS quality measurements? • Is SOFA scoring in the ED possible? Is quickSOFA scoring helpful? • How can you identify the origin of the infection? • What are the lactate clearance, ScvO2, and mean arterial pressure values that you must measure and monitor? • What methods of fluid assessment should be used? • Which vasopressor is the first-line choice? Antibiotics? • Is there a role for imaging in sepsis? • Who needs to go to the ICU and who can be discharged? Sepsis is a common and life-threatening condition that requires early recognition and swift initial management. Diagnosis and treatment of sepsis and septic shock are fundamental for emergency clinicians, and include knowledge of clinical and laboratory indicators of subtle and overt organ dysfunction, infection source control, and protocols for prompt identification of the early signs of septic shock. This issue is a structured review of the literature on the management of sepsis, focusing on the current evidence, guidelines, and protocols. This issue of Emergency Medicine Practice reviews the recent changes in sepsis criteria, prognosticators, and quality metrics and offers recommendations on the recognition and treatment of sepsis, severe sepsis, and septic shock in the emergency department. Sepsis-3 cited new insights into sepsis pathobiology, the lack of sensitivity and specificity of SIRS criteria, and the excessive focus on inflammation as some of the reasons for the changes. The updated definitions in Sepsis-3 emphasize organ dysfunction in the setting of infection, which can be quantified using the sequential (sepsis-related) organ failure assessment (SOFA) score. For expansion of the criteria for scoring SOFA, see Table 1. Emergency clinicians should note that the current Centers for Medicare and Medicaid Services (CMS) SEP-1 quality measure, which is used to evaluate institutional sepsis bundle compliance, has not adopted Sepsis-3. The controversial CMS SEP-1 mandate is based on the presence of SIRS criteria, categorizes any infection with organ dysfunction as severe sepsis, and defines septic shock as “hypotension not responsive to fluids or serum lactate ≥ 4 mmol/L regardless of hypotension.”25,26 Therefore, hospital quality measures assess CMS quality metrics based on the 2001 International Sepsis Definitions Conference11 and not Sepsis-3. There is no indication that this will change, so it is important to know the differing metrics and definitions. A comparison of Sepsis-3 to the 2001 Sepsis definitions as well as CMS SEP-1 criteria are presented in Table 2. For additional information on calculating the SOFA score, see the online version of the supplement, Calculated Decisions. 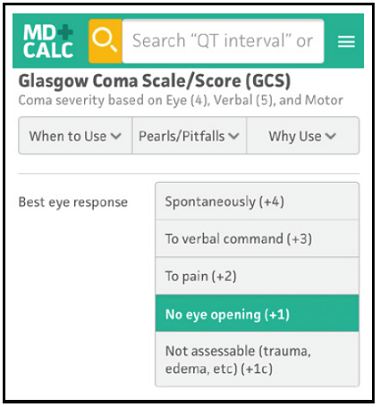 For additional information on calculating the Glasgow coma scale score, see the online version of the supplement, Calculated Decisions. For additional information on calculating the quick SOFA score, see the online version of the supplement, Calculated Decisions. To evaluate clinically relevant articles regarding the diagnosis and early management of sepsis, severe sepsis, and septic shock, a search of the National Library of Medicine PubMed database was performed using the following search terms: sepsis management, septic shock management, and clinical sepsis treatment guidelines, with a date range of 2000 to 2018. Acknowledging the breadth of the sepsis literature, additional specific searches were performed including intravenous fluids, antibiotics, vasopressors, corticosteroids, lactate, lactate clearance, and sepsis. References relevant to prehospital and emergency department (ED) care of septic patients were included. Only adult, human studies were considered, and publications in English (with the exception of 3 Chinese studies on lactate clearance). Current consensus guidelines were also reviewed. Guidelines have recently been augmented with high-powered randomized clinical trials of sepsis and septic shock that evaluated management strategies, adding to specific recommendations for treatment and resuscitative endpoints. Several studies have recently examined invasive (EGDT) versus less-invasive early resuscitation strategies, and these results have led to recommendations against routine use of invasive strategies that do not confer a mortality benefit. Recommendations for volume of intravenous (IV) fluids, early antibiotics, and infection source control are based on national metrics and observational studies and not randomized clinical trials of early sepsis patients. Randomized trials using serum lactate for both screening and as a resuscitative endpoint support a strong recommendation for its use. Norepinephrine is the current vasopressor of choice, given both randomized trial data and several observational studies. A recent large randomized trial of hydrocortisone for septic shock did not show mortality benefits, but did show improved secondary outcomes. Lactate clearance can aid in assessing a patient’s response to treatment. Persistently elevated lactate may indicate inadequate resuscitation or alternative diagnoses. Particular attention should be given to patients with limited lactate clearance, as persistent elevation is associated with poor outcomes. Patients with presumed sepsis and hypotension have an increased mortality when antibiotics are delayed. In such cases, administering broad-spectrum antibiotics prior to source confirmation is recommended. For stable patients in whom sepsis is being considered, source-directed antibiotics should be administered as soon as practical and, ideally, within 1 hour of sepsis recognition. Recent literature and guidelines support norepinephrine as the first-line vasopressor for septic shock. Dopamine is associated with increased risk of arrhythmias and mortality compared with norepinephrine. Evidence-based medicine requires a critical appraisal of the literature based upon study methodology and number of subjects. Not all references are equally robust. The findings of a large, prospective, randomized, and blinded trial should carry more weight than a case report. To help the reader judge the strength of each reference, pertinent information about the study, such as the type of study and the number of patients in the study is included in bold type following the references, where available. In addition, the most informative references cited in this paper, as determined by the author, are highlighted. Sepsis is a life-threatening organ dysfunction caused by a dysregulated host response to infection. Sepsis is the most expensive cause of hospitalization. The systemic inflammatory respiratory syndrome (SIRS) criteria have poor sensitivity and specificity for identifying sepsis. Sepsis-3 proposed a new bedside assessment tool called qSOFA (quick systemic organ failure assessment). qSOFA has 3 components: (1) respiratory rate > 22 breaths/min, (2) altered mental status, and (3) systemic blood pressure (SBP) ≤ 100 mm Hg. Having 2 or more criteria in the correct clinical setting is suggestive of sepsis. Disclaimer: This is the unedited transcript of the podcast. Please excuse any typos. Jeff: Welcome back to EMplify, the podcast corollary to EB Medicine’s Emergency Medicine Practice. I’m Jeff Nusbaum, and I’m back with my co-host, Nachi Gupta. This month, we’ll be talking Updates and Controversies in the Early Management of Sepsis and Septic Shock. We have a special episode for you this month… We’ve brought Dr. Jeremy Rose, one of the peer reviewers, and a sepsis expert, on with us to talk through the content this month. Jeremy: Dr. Jeremy Rose here. Thanks for having me in on this conversation. I’m always happy to talk about this topic because it’s clearly important. There’s a great deal of confusion around sepsis and I hope that in the next couple minutes we can clarify things in a way that really helps your average front line doc trying to get it right. 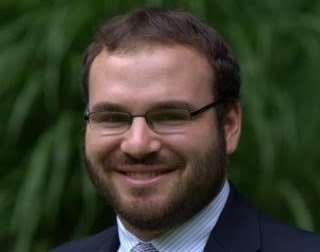 Jeremy: I’m the Assistant Medical Director and Sepsis Chair at Mount Sinai Beth Israel in Manhattan. For those listening, my hospital probably looks a little bit like yours. We’re busy, interesting, and just a little rough around the edges. We like it that way. More importantly, though, we mirror the national averages regarding sepsis. Roughly half of in-hospital mortality is associated with sepsis in some fashion. Pretty incredible when you think about it. Half. Jeff: Sepsis chair... clearly this is an important topic if it warrants it’s own chair at a major hospital in NYC. But getting back to the article this month. This month’s issue was authored by Faheem Guirgis, Lauren Page Black, and Elizabeth DeVos of the University of Florida, Department of Emergency Medicine. Nachi: And it was peer reviewed by Michael Allison, Assistant Director of the Adult ICU at Saint Agnes Hospital, and Jeremy Rose and Eric Steinberg of Mount Sinai Beth Israel. Jeff: So as well all know, sepsis is bread and butter emergency medicine, but, what is sepsis? It seems that every month or so we have a new guideline, bundle, definition, or whatever… I think it’s best to start with the basics - At its core, sepsis is a dysregulated response to infection that can be life-threatening. Nachi: Right and it’s the combined inflammatory with immunosuppressive features of sepsis that lead to the devastating organ dysfunction and even death. Optimal management of septic patients has been a source of intense research, stemming from the landmark study by Rivers in 2001. Jeremy, can you give us a little historical context there? Jeremy: Rivers was a real pioneer. He found a 16% mortality reduction with randomization to an early aggressive care bundle. Amazing work. That being said, many components of that bundle have since been disregarded. For example, Manny Rivers would measure CVP in all of his patients, something we rarely do. Nachi: Not to cut you off and steal your thunder there, but we’ll get to the most recent updates in management shortly. Let’s first talk definitions and terminology, and specifically, diagnosis, which is definitely a big elephant in the room. As Jeff mentioned a few minutes ago, diagnostic criteria have undergone so so so many changes. Jeff: Yes it has! 1991 marked the first standardized definition. Then in 2001, sepsis-2 was introduced. In 2014, the Society of Critical Care Medicine and the European Society of Intensive Care Medicine started a task force, and by 2016, updated definitions were out again! Sepsis-3!! A lot of this came after the realization that SIRS was just too broad and was overly sensitive and non-specific. Jeremy, why don’t you take us through Sepsis 3. Here’s the fundamental problem: As we like to say, “there’s no troponin for sepsis.” And if you look at our patients, we tend not to miss the hypotensive, tachycardic, febrile patient. We know they’re septic. But how do we find the ones who don’t look as sick? Frequently elderly, possibly with normal-ish vitals and no fever. Those can be a lot harder to spot, but they may indeed be septic. Also, for research purposes we have to have a common definition, so Sepsis 3 came up with something called the SOFA score. The problem with the SOFA score is that its difficult to perform in the ED. It has parameters like bilirubin that often aren’t available when we want to screen out very sick patients. Fortunately there is the abridged version qSOFA, which identifies non-ICU patients who are at high risk of inpatient mortality. There are ONLY 3 criteria to the qSOFA. 3 Criteria. RR > 22; AMS; SBP <= 100. That’s it. If you have two of these criteria, you are up to 14 times more likely to die of sepsis during a hospital admission. That’s pretty profound; these patients are very sick. This is meant to replace SIRS. It also captures a much sicker population than the patients included in the Medicare definition. Jeff: So why do you think these parameters turn out to be so useful? Jeremy: Drilling down into these criteria you can see the pathophysiology at work. Obviously, SBP < 100 means sick. Interestingly, an elevated RR also turns out to be prognostic, because you’re seeing the compensation for an underlying acidosis. WHen you see a patient breathing quickly, it’s either from a primary respiratory problem or them trying to relieve an underlying acidosis. The caveat here is that you have to check it. At our hospital in southern Manhattan, patients tend to breathe around 16. At our hospital in northern Manhattan they like to breath around 18. It’s probably because the air is thinner. Seriously though, you have to actually measure RR for this to work. Temp is not in QSOFA but we should be checking that too. And I mean checking it by putting something that measures temperature inside the patient. We’ve looked at the forehead and tympanic thermometers and in real world conditions, they tend to underestimate by a degree or more. Think about that. A patient with a headache and a temperature of 99.5 is a very different patient than one with a temp of 100.5. Make sure you measure temperature. Nachi: Very true and these two patients can definitely go down very different management pathways! Rounding out our discussion on sepsis-3. We should note that severe sepsis is now a term of the past under Sepsis-3. And sepsis-3 redefined septic shock as “hypotension not responsive to fluid resuscitation” with the added requirement of vasopressors to maintain a MAP greater than or equal to 65 and with a lactate > 2. So quite a few changes! Jeff: And Jeremy, sticky topic coming up here. Centers for Medicare and Medicaid Services (or CMS) quality measures - They haven’t really caught on to and adapted to Sepsis-3 yet, have they? Jeremy: The CMS mandate is based on the presence of SIRS criteria. Sepsis 3 is based on SOFA. This is definitely confusing. Part of the challenge in discussing this topic is separating out the QI guidelines from what is actually relevant to patient care based on the latest evidence-based medicine. Nachi: That seems fair. We’re really going to put you in an uncomfortable spot for a second and push you here Jeremy. Do you have any insight into why CMS isn’t interested in following the mountains of research that have led to sepsis-3? Is there a reason they are sticking to their current criteria? Jeremy: I think some of it is the slow pace of bureaucracy and the time that it takes to develop a consensus on management. Even if we can agree on who is septic, it’s really hard, if not impossible to link the care to a pay-for-performance metric which is what CMS ultimately would like to see. That’s not how Sepsis-3, or for that matter, SIRS, was designed to be used. You’re trying to take a tool which was originally designed for research and mold them into a tool used for pay for performance. Nachi: What a struggle. The CMS metrics are slightly different from the 2001 sepsis guidelines also. Take a look at Table 2 of the article for a quick comparison of sepsis-3, 2001 sepsis, and cms side-by-side. And for those on twitter, we’ll be sure to tweet this table out too for your review. Jeff: With so many different scores and definitions, I think that adequately sets the stage for the challenge this month’s authors faced coming up with real evidenced based guidelines. Nachi: Oh absolutely. And to make matters worse - this is a HUGE problem. We’re talking up to 850,000 ED visits annually in the US, and 19 million cases worldwide. Compounding this, sepsis results in death in approximately 1 out of 4 cases. Not only is it lethal, it is also very costly -- 17 billion dollars per year in the US alone! Jeff: And don’t forget importantly the 30-day hospital readmission rate. Sepsis is coming in at a higher readmission rate and cost per admission than acute MI, CHF, COPD, and PNA. Nachi: Let’s speak briefly on the etiology and pathophysiology of sepsis: we all know that sepsis is due to local infections that then become systemic. Previously, it was believed that the bacterial infection itself was the cause of the clinical syndrome of sepsis. However, we now know now that the syndrome of sepsis is due to the inflammatory and immunosuppressive mediators that were triggered by the infection. Normal immune regulatory safeguards fail and this leads to the syndrome. And interestingly, several studies have shown that critically ill septic patients experience reactivations of specific viruses that were previously limited to patients with severe immunosuppression. Jeff: Definitely something to look out for in your critically ill septic patients. We should talk briefly about the most common inciting infections that lead to sepsis. In order, these are: pneumonia, intra-abdominal infections, and urinary tract infections. No surprises there! Jeremy: This is another interesting topic that has received plenty of attention. CMS loves blood cultures. It’s an easy metric to track. That doesn’t mean they’re always helpful. We looked at our patients with lactates between 2.1 and 4.0 which had “severe sepsis.” These patients were normotensive though, In other words, the ones that aren’t that sick. We found that blood cultures are useful about 20% of the time. That’s not bad. So what do we do? We draw cultures before pushing antibiotics. Is that helpful? Sometimes yes, does it waste money? Debatable. Does it help us meet our metrics, yes. Jeff: And I think that gets at the crux of the problem here: we don’t want to delay antibiotics on anybody, but we must balance this with the potential harm of further increasing the drug resistant bacterial population via sound antibiotic stewardship. Remember also that there is a broad differential for sepsis, with several “sepsis mimics”. To name a few, we have PE, MI, CHF, acute pulmonary edema, DKA, thyroid storm, GI bleeds, drug intoxications, and withdrawal syndromes, just to name a few. In case that wasn’t enough check out Table 3 of the article. Nachi: And we already mentioned the leading causes of sepsis, that’s pneumonia, intra abdominal infections, and uti’s. But remember the source can be anywhere. Be sure to also think of pyelonephritis, central line associated bloodstream infections, prosthetics, endocarditis, necrotizing fasciitis, and meningitis. Jeff: I don’t think we need to dwell on this much longer - basically the differential is huge. Let’s move on to my favorite section - prehospital care. Jeremy: 20 pages of evidenced based recommendations and your favorite is the prehospital section, what’s up with that? Jeff: I’m an EMS fellow, what can I say… Anyway, on to my favorite section -- prehospital care. This is always a hot topic because the prehospital period is a special opportunity to get early interventions in for septic patients as 40 - 70% of all severe sepsis hospitalizations arrive via EMS. Nachi: And in one study taking place in a large metropolitan area, prehospital care time was over 45 minutes, and less than 37% arrived with IV access. Of course, these numbers would vary significantly based on where you practice. Jeff: So get this -- one study showed that out-of-hospital shock index and respiratory rate were highly predictive of ICU admission. So clearly early recognition and therapy may play a role here. Another study, however, showed knowledge gaps by advanced EMS providers in diagnosis and management of sepsis. And yet another study showed that only 18 to 21% of confirmed septic patients were suspected of having sepsis by EMS. Out of hospital fluids were started in only half of patients with severe sepsis. In essence, there is likely a strong role here for pre hospital protocols for identifying and treating sepsis. Nachi: In terms of pre hospital treatments though, prehospital IV fluids haven’t been shown to improve mortality, but have been associated with shorter hospital stays. Prehospital sepsis protocols have been described, but in general more research is needed in this area. Jeff: While prehospital care hasn’t yet been shown to improve the prognosis of septic patients, those presenting via EMS do have shorter delays to initiation of antibiotics, IV fluids, and early care bundles. EMS should focus primarily on stabilizing vital signs and providing efficient transport. If it’s possible to establish an IV and initiate fluids without delaying transport, EMS should do that as well. Nachi: And of course, oxygen for the hypoxic patients! Moving on to history and physical for your presumed septic patient. Jeremy, what are the big hitting things here that you always ask and check for, and that you make sure your residents are doing? Jeremy: After ABC’s and glucose, AMS is really important, it’s in the QSOFA SCORE. Unfortunately, this can be hard in many septic patients where they’re baseline mental status is less than perfect. The other thing is to try and find the source. Finding the source lets you make wise choices about therapy. Jeff: Great point about the mental status - so many of our older population have an altered baseline, but recognizing changes from that baseline is key. Jeremy: Brace yourself: lactate is really important in septic patients. That being said, not every cause of elevated lactate is sepsis. There is this animal called Type B lactic acidosis can come from numerous drugs like albuterol. Just because you see elevated lactate doesn’t mean you can forget about the other causes. That being said, we know that patients with sepsis do better when they clear lactate. Jeremy: For sure. At least until you have a reasonable trend towards improvement. We know lactate clearers do better. We’ve looked at our own lactate numbers. Interestingly, the takeoff point for sepsis seems to be around 2.5. Meaning that patients with altered vitals and lactates above 2.5 tend to do worse. But, there is a broad ddx to elevated lactate. What is true, though, is that lactate is a marker for badness. If your patient’s lactate is rising, yours should be too. Nachi: I bet I’m a “lactate clearer”. I may add “lactate clearer to my CV,” sounds impressive. But I digress… Next up we have Procalcitonin. Since procalcitonin becomes elevated in those with bacterial infections, intuitively, this should be a valuable marker to assess in potentially septic patients. Unfortunately procalcitonin lacks negative predictive value so most literature supports its use in diagnosing pulmonary infections and for antibiotic de-escalation. Jeff: Good to know, I’ve seen it being used a lot more recently and wondered how evidence based this test was. Jeremy: Honestly, I don’t see Procalcitonin changing ED management at the moment. If you’re waiting for procalcitonin to start antibiotics or fluids, you’re waiting too long. Nachi: Moving on, let’s talk imaging. Based on current studies, the authors recommend focused imaging only. In addition, they also note that our good friend, the point of care ultrasound, likely plays a role, as in one study, POCUS demonstrated a 25% improvement in sensitivity from clinical impression alone. Jeremy: I think there are two ways POCUS comes in. One, lung ultrasound can be really useful to find that occult pneumonia or differentiating pneumonia from CHF. Two, your ultrasound is your best tool for assessing volume status. I try to look at the IVC of all my septic patients and echo them when possible. Nachi: Right. So now we’ve examined, drawn labs and cultures, checked a lactate, may be obtained imaging… next up we should probably start treating the patient. Whether you like it or not, we have to discuss CMS. Jeremy: Just to clarify before we start. CMS defines “severe sepsis” as SIRS + infection with a lactate of 2.1-4.0. Septic shock is SIRS + infection with hypotension or a lactate > 4.0. That’s where we’re at. Jeff: Good point. Back to treatment: within the first 3 hours, for any patient with sepsis and septic shock, you must measure a lactate, obtain 2 sets of blood cultures, administer antibiotics, and give an isotonic fluid challenge with 30 cc/kg to patients with hypotension or a lactate greater than 4. Then, within the first 6 hours, you must apply vasopressors to achieve a MAP of at least 65, re-assess volume status and perfusion, and remeasure a lactate. Nachi: This begs the question - are these recommendations evidenced based? Jeremy…. Jeremy: I’m so glad you asked that . Let’s start with fluids. Patient’s need adequate fluid resuscitation. Interestingly there are 3 large RCT’s, PROMISE, PROCESS and ARISE, that compared a Rivers type bundle to usual care. Surprisingly, they showed no difference. But when your drill down into these 3 trials, you see that “the usual care,” now generally includes at least 2 liters of fluid. Jeff: Ok, so it seems that there is some pretty good data to support a rapid fluid challenge of at least 30 cc/kg. But how do we determine who needs more fluids and how much more they need. There must be an endpoint to all of this? Jeremy: Another million dollar question. 30cc/kg is probably a good place to start. How much is too much? I think we need to be smart about our fluids. Some patients will need less and some will need much more. So, I remind my resident’s to be smart about fluids. Sono an IVC, trend a lactate, follow a urine output, do a passive leg raise, even check JVP. I mean just because you haven’t seen a unicorn doesns’t mean they’re not real. Do something to monitor volume status. Nachi: Very important. Put your ultrasound skills to work here. They’ll only improve as you practice more. Jeff, let’s get started on the ever important topic of antibiotics. Jeff: Sounds good. Current guidelines recommend that broad spectrum antibiotics be administered within the first hour of presentation for those with sepsis or septic shock, ideally with blood cultures being drawn beforehand. In one study, every hour of delayed abx administration was associated with an 8% increase in mortality. Since this 2006 study, other studies have had mixed results - with studies showing increased odds of death with delays in abx administration and others showing only a benefit in those with septic shock with or without hypotension with no benefit to those without shock. Nachi: In terms of antibiotic coverage - you need to consider the site of infection, local resistance patterns, the presence of immunosuppression, and the patient’s age and comorbidities. Table 5 of the article is very thorough and should be kept as a quick reference. Jeremy do you have any specific recommendations for our listeners on how we should approach antibiotic usage in the septic patient? Jeremy: I like to think about antibiotics a little more simply than referencing a table. I ask a couple questions. Does my patient need MRSA coverage ? Does my patient need Pseudomonal coverage? If the answer is no and no, then narrow your coverage. You don’t necessarily have to use a bunch of Vanco, or a big gun antipseudomonal like Pip/tazo. Also, have a look at your local antibiogram. I can’t tell you how many times this changes prescribing habits for even things like simple UTIs. I’m going to stray into some controversial territory here. The benefits of sepsis protocols are measured one patient at a time, but the harms are only measured in the aggregate. What does that mean? CMS metrics have caused us to use to use more broad spectrum antibiotics. As a result, we’re seeing more resistance. My resident’s tell me to make it easy, give em VZ (that’s vanco/zosyn) and it kills me. Every time you put a Z-pack into the world a pneumococcus gets it’s wings. So think more about your antibiotics, and know your local biograms. Jeff: That’s a great way to think about it, I fear I’ve given a lot of pneumococci wings during my training… Next we’re on to vasopressors. The data is pretty clear on this one - norepinephrine is the recommended first line vasopressor for septic shock. In numerous trials comparing Norepi to dopamine, NE was far superior, with dopamine increasing arrhythmias in one trial and associated with an increased risk of death as compared to NE in another trial. Jeremy: So here’s a question I get all the time: How can I give Norepi without a central line. Let’s use Dopamine, its safe peripherally. Ok, so follow that through. We’re going to give a drug to increase blood pressure by constricting blood vessels, but don’t worry, it’s safe peripherally. What does that mean? It means it doesn’t work!! It doesn’t give much blood pressaure. Dopamine is a lousy pressor. It causes a lot of tachycardia, which is not what you want in failing septic hearts. So what do we do if we don’t have a central line? We start norepi peripherally into a large bore IV for the time it takes us to get a central line. That’s where the evidence is. There’s a mortality benefit to NE over dopaine in septic shock. Jeff: Right, this month’s authors note peripheral pressors may be safe for brief periods in settings with close monitoring. While this is commonplace in some hospitals, others haven’t yet jumped on that bandwagon. I think it’s important to mention that this is becoming more and more commonplace, even in the prehospital realm. With the service I fly for, we routinely start peripheral vasopressors without hesitation. But this isn’t limited to the air. Many ground 911 services have also adopted peripheral vasopressors in a variety of settings. Nachi: I’m sure there are many trials to come in the future documenting their safety profile, but moving on to the next pressor to discuss... vasopressin. This should be your second line vasopressor for septic shock. In the VASST trial, low-dose vasopressin was found to be noninferior to NE. In other trials, vasopressin also appeared to show a potential benefit in those with AKI and sepsis, although the subsequent VANISH trial (perhaps the best name for a clinical trial so far) failed to demonstrate a benefit to vasopressin titration with regard to renal outcomes in septic shock. Vasopressin has also been shown to reduce NE dosing when administered at a fixed dose of 0.03-0.04 units/min. Jeff: Next we have epinephrine. In one study epinephrine and NE were equivalent in achieving MAP goals in ICU patients with shock, however several of those receiving epi developed marked tachycardia, lactic acidosis, or an increased insulin requirement. The increasing lactic acidosis could confound the trending of lactates, so in those requiring inotropy in addition to some peripheral squeeze - the authors recommend adding dobutamine to norepinephrine instead of starting epinephrine. Although, keep in mind, this can lead to some hypotension so remember to start at low doses. Nachi: Phenylephrine, a pure alpha adrenergic agent, is next and should be considered neither first nor second line, but it may have a role as a push dose agent while preparing other vasoactive agents. Jeff: And lastly, we have angiotensin 2. One recent 2017 study examining the role of angiotensin 2 in those with septic shock already on 0.2 mcg/kg/min of NE found that those receiving AT2 had significant improvements in MAPs as well as cardiovascular SOFA score at 48h with no difference in mortality. Unfortunately, these benefits do not come without risk as AT2 may increase risk of arterial and venous thrombosis and potentially thromboembolism. Clearly, one study isn’t enough to change practice, but it’s certainly food for thought. Nachi: So that wraps up vasopressors. Jeremy, we’re on to corticosteroids -- another hotly debated topic. When do you give steroids in sepsis? Jeremy: Hmmm steroids, this is an age old question. No study has clearly supported the blanket use of steroids in septic shock. Several like CORTICUS and ADRENAL showed no difference. I will use hydrocortisone for pressor refractory shock. Meaning, you’ve tried everything else, so you might as well try. Also, I do tend to avoid Etomidate, given the possibility of adrenal suppression and that there are several other induction agents, notably Ketamine that don’t have this problem. Jeff: Those trials are certainly important, thanks for bringing them up - Especially with all the FOAM content out there, it’s incredibly important to look back at the data to understand where certain recommendations are coming from. Anyway… one quick note on blood transfusions before we move on to special populations - Although part of the original early goal directed therapy, thanks to data from the TRISS trial which showed no difference in outcomes with a transfusion goal of 7 vs 9, transfusions are reserved for those with a hbg of less than 7. Jeremy: One population we should make sure to mention and be careful with is end stage liver disease. In the ER, we tend to miss SBP alot. Mostly because these patients have lots of reasons to be sick and they already have elevated lactate because of their deceased clearance. My practice is to give a dose of Ceftriaxone and sent a diagnostic tap to patients who are sick and have ascites. Nachi: Alright Jeremy, let’s talk controversies in sepsis. We’re giving you all the big questions this month! Jeremy: We’ve already talked about fluids and how much to give. Just a reminder that a history of CHF doesn’t preclude proper fluid resuscitation. I think broad spectrum antibiotics for relatively well patients is a big controversy. Our national rates of antibiotic resistance are terrible, and yet we’re using more antibiotics all the time. There are very few if any antibiotics coming down the pharma pipeline and we’re going to have to face the music eventually. Finally, we need national metrics that mirror clinical evidnece. Protocols should be a tool and not a crutch. You know what’s best for the patient in front of you, so don’t let metrics or protocols make you do things you think are not in your patient’s best interest. Nachi: So how do you escape the hospital protocols and CMS and do what’s best for your patient without “getting in trouble”? Jeremy: Here’s how I deal with it as the one who reads and QI’s all of our sepsis charts. I tell my colleagues to do what’s right, and if you need to deviate from the protocol tell me why. As long as you can explain your decision, I’ll support it. Explaining your thinking is good clinical practice and is good medico-legal practice. CMS has been unable to link these metric to payment, simply because no hospital can meet them with any regularity. It’s important that we advocate for our patients or nothing will change. Make them respect you for the highly educated professional that you are, and your patients will ultimately benefit. Jeff: Preach!! And before we close out with disposition, there are a few new therapies and trials on the horizon to keep a lookout for. The RACE trail examined the role of L-carinitine. The VICTAS trial is looking at vitamin C, thiamine, and steroids in sepsis. The CLOVERS trial is looking at early vasopressors vs a crystalloid liberal strategy. And lastly, IL-7 is also being investigated. All really cool stuff that could change how we manage sepsis in the future..
Nachi A few quick notes on disposition before we close this episode out. Certainly not all patients meeting SIRS require admission, but many do. Those with qSOFA of 2 or higher represent a sick population and an ICU admission should be considered. Even for those with a qSOFA of 1 but a lacate over 2 -- they have a mortality approaching that of patients with a qSOFA of 2. Be careful just sending a patient who is on the fence to the floor because several studies have demonstrated that patients who are later upgraded have worse outcomes. Jeff: That’s in line with the general themes we’ve laid out today - definitely better to start early with aggressive care rather than play catch up later. Jeremy - in 30 seconds or less, what are the most salient points in the management of sepsis that you would like our listeners to take with them from this episode. Norepi, not Dopamine - it doesn’t work! Be smarter about antibiotic use! You are the best advocate for your patient, despite what anyone else says! Jeff: Excellent, so that wraps up the October 2018 episode of Emplify. A big thanks to Jeremy Rose for joining us. Jeremy: Thank you for having me!!! It was great talking with you. Nachi: For our listeners -- additional materials are available on our website for Emergency Medicine Practice subscribers. If you’re not a subscriber, consider joining today. You can find out more at www.ebmedicine.net/subscribe. Subscribers get in-depth articles on hundreds of emergency medicine topics, concise summaries of the articles, calculators and risk scores, and CME credits. You’ll also get enhanced access to the podcast, including the images and tables mentioned. You can find everything you need to know at ebmedicine.net/subscribe. Jeff: And the address for this month’s credit is ebmedicine.net/E1018, so head over there to get your CME credit. As always, the ding sound you heard throughout the episode corresponds to the answers to the CME questions. Nachi: Lastly, be sure to find us on iTunes and rate us or leave comments there. You can also email us directly at emplify@ebmedicine.net with any comments or suggestions. Talk to you next month! Drs. Gupta and Nusbaum are practicing emergency physicians. Join Jeff, a former firefighter, and Nachi, a former mathematician, as they take you through the October 2018 issue of Emergency Medicine Practice: Updates and Controversies in the Early Management of Sepsis and Septic Shock. Get quick-hit summaries of hot topics in emergency medicine. EMplify summarizes evidence-based reviews in a monthly podcast. Highlights of the latest research published in EB Medicine's peer-reviewed journals educate and arm you for life in the ED. The SOFA score predicts mortality risk for patients in the intensive care unit based on lab results and clinical data. The qSOFA score identifies patients with suspected infection who are at high risk for in-hospital mortality outside of the intensive care unit. The Glasgow coma scale (GCS) estimates coma severity based on eye, verbal, and motor criteria. The SOFA score predicts mortality risk for patients in the intensive care unit based on lab results and clinical data. The Sequential Organ Failure Assessment (SOFA) is a mortality prediction score that is based on the degree of dysfunction of 6 organ systems. The score is calculated at admission and every 24 hours until discharge, using the worst parameters measured during the prior 24 hours. As individual scores for each organ to determine the progression of organ dysfunction. As a sum of scores on a single intensive care unit (ICU) day. As a sum of the worst scores during the ICU stay. The SOFA score stratifies mortality risk in ICU patients without restricting the data used to admission values. The SOFA score can be used to determine the level of organ dysfunction and mortality risk in ICU patients. The SOFA can be used on all patients who are admitted to an ICU. It is not clear whether the SOFA is reliable for patients who were transferred from another ICU. Calculate the SOFA score using the worst value for each variable in the preceding 24-hour period. Even though it is calculated sequentially based on the worst value for each variable in the past 24 hours, the SOFA score is not meant to indicate the success or failure of interventions or to influence medical management. Abbreviations: ICU, intensive care unit; SOFA, sequential organ failure assessment. Clinical prediction scores such as the SOFA and the Acute Physiologic Assessment and Chronic Health Evaluation (APACHE II) can be measured on all patients who are admitted to the ICU, to determine the level of acuity and mortality risk. This information can then be used in various ways, such as to provide the family with a prognosis, for clinical trials, and/or for quality assessment. The SOFA score is not designed to influence medical management. It should not be used dynamically or to determine the success or failure of an intervention in the ICU. The SOFA variables were selected by a working group of the European Society of Intensive Care Medicine (Vincent 1996). In the initial validation study, 1449 patients were enrolled over a period of 1 month from 40 ICUs in 16 countries (Vincent 1998). The study found that the SOFA score had a good correlation to organ dysfunction/failure in critically ill patients. The SOFA score was also prospectively validated in an observational cohort study conducted by Ferreira et al (2001) at the ICU of a university hospital in Belgium. The study included 352 patients and found that the SOFA score was a good indicator of prognosis. The qSOFA score identifies patients with suspected infection who are at high risk for in-hospital mortality outside of the intensive care unit. The quick Sequential Organ Failure Assessment (qSOFA) was introduced by the Third International Consensus Definitions for Sepsis and Septic Shock (“Sepsis-3”) as a simplified version of the Sequential Organ Failure Assessment (SOFA). The SOFA is a validated intensive care unit (ICU) mortality prediction score; the qSOFA was derived by Sepsis-3 to help identify patients with suspected infection who are at high risk for poor outcome (defined as in-hospital mortality or an ICU stay of ≥ 3 days) outside of the ICU. The qSOFA simplifies the SOFA significantly by including only 3 clinical criteria, each of which are easily assessed at the bedside. Calculation of the qSOFA score can be repeated serially if there is a change in the patient’s clinical condition. The qSOFA score predicts mortality but does not diagnose sepsis, and it still has an unclear role in the sequence of events from screening to diagnosis to the triggering of sepsis-related interventions. At this time, no prospective studies have demonstrated that clinical decisions based on the qSOFA lead to better patient outcomes. The most recent Surviving Sepsis Campaign guidelines, published in March 2017, do not integrate the qSOFA into recommendations for screening or diagnosis of sepsis. The qSOFA score identifies patients with suspected infection who are at high risk for in-hospital mortality outside of the ICU. It may help increase suspicion or awareness of a severe infectious process and prompt further testing and/or closer monitoring of the patient. Use the qSOFA for patients aged ≥18 years who have a confirmed or suspected infection and are in a non-ICU setting (ie, prehospital, ward, emergency department, or step-down unit). 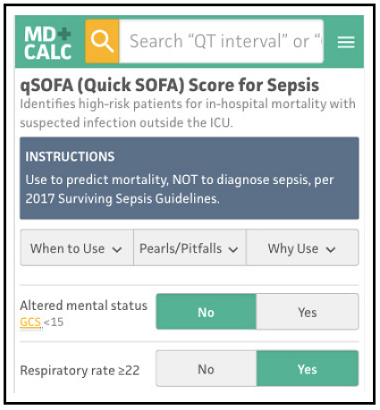 The qSOFA score should be used to predict mortality, not to diagnose sepsis, per the 2016 Surviving Sepsis Campaign guidelines. A “positive" qSOFA score (≥ 2) suggests high risk of poor outcomes in patients with suspected infection. These patients should be more thoroughly assessed for evidence of organ dysfunction. A positive qSOFA score by itself should not trigger sepsis-directed interventions such as the initiation of broad-spectrum antibiotics; rather, it should prompt clinicians to further investigate for the presence of organ dysfunction or increase the frequency of patient monitoring. Abbreviations: ICU, intensive care unit; qSOFA, quick sequential organ failure assessment. The Sepsis-3 task force recommended that a positive qSOFA score should prompt the calculation of a SOFA score to confirm the diagnosis of sepsis. This recommendation remains controversial, as the qSOFA has been shown to be more predictive than the SOFA outside of the ICU setting. Even if the patient’s qSOFA score is initially "negative" (< 2), it can be repeated if there is a change in the patient’s clinical status. The qSOFA is a mortality predictor, not a diagnostic test for sepsis. It is still not clear how it will be used in the sequence of events from screening to diagnosis of sepsis to the triggering of sepsis-related interventions. The management of sepsis is continuously evolving and is detailed in the 2016 Surviving Sepsis Campaign: International Guidelines for the Management of Sepsis and Septic Shock (Rhodes 2017). 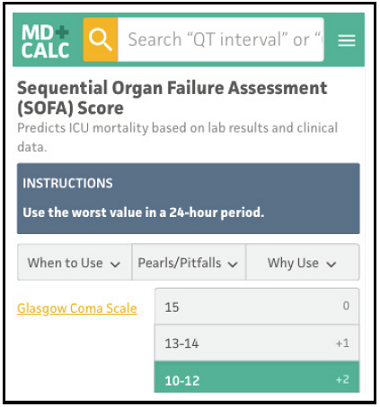 The qSOFA was introduced in February 2016 by the Sepsis-3 task force as a rapid, bedside clinical score to identify patients with suspected infection who are at greater risk for poor outcomes. The primary outcome was in-hospital mortality, and the secondary outcome was an ICU length of stay of ≥ 3 days. The qSOFA was meant to replace the systemic inflammatory response syndrome (SIRS) criteria, which were believed to be less sensitive and specific, although this remains controversial. Seymour et al retrospectively derived and internally validated the qSOFA in a 2016 study that included 148,907 patients with suspected infection, either inside or outside of the ICU setting. For patients outside of the ICU with a qSOFA score ≥ 2, there was a 3- to 14-fold increase in the rate of in-hospital mortality. Among ICU patients, however, the predictive validity of the SOFA for in-hospital mortality was statistically greater than the qSOFA. The qSOFA was prospectively validated in an emergency department population in a study by Freund et al published in 2017. The study, which included 879 patients across 30 emergency departments in 4 countries, found that use of the qSOFA resulted in greater prognostic accuracy for in-hospital mortality than either SIRS or severe sepsis. Raith et al (2017) externally validated the SOFA and the qSOFA in a retrospective cohort analysis of 184,875 patients who had an infection-related admission diagnosis. The study found that, in an ICU population, an increase in the SOFA score of ≥ 2 points had greater prognostic accuracy for in-hospital mortality than the SIRS criteria or the qSOFA. The Glasgow coma scale (GCS) estimates coma severity based on eye, verbal, and motor criteria. The Glasgow coma scale (GCS) allows providers in multiple settings and with varying levels of training to communicate succinctly about a patient’s mental status. The GCS score has been shown to have statistical correlation with a broad array of adverse neurologic outcomes, including brain injury, need for neurosurgery, and mortality. Correlation with outcome and severity is most accurate when the GCS is applied to an individual patient over time; the patient’s trend is important. A GCS score of 8 should not be used in isolation to determine whether or not to intubate a patient, but does suggest a level of obtundation that should be evaluated carefully. Reproducibility of the GCS score can be low; if individual institutions have concerns about agreement between providers, training and education are available online from the GCS creators at www.glasgowcomascale.org. There are simpler scores that have been shown to perform as well as the GCS for initial evaluation in the prehospital and emergency department setting; these are often contracted versions of the GCS itself. For example, the simplified motor score (SMS) uses only the motor portion of the GCS. THE SMS and other contracted scores are less well studied than the GCS for outcomes like long-term mortality, and the GCS has been studied as trended over time, while the SMS has not. The GCS is an adopted standard for mental status assessment in the acutely ill trauma and nontrauma patient and assists with predictions of neurological outcomes (complications, impaired recovery) and mortality. The GCS is designed for use in serial assessments of patients with coma from either medical or surgical causes and is widely applicable. The GCS is commonly used in the prehospital and acute care setting as well as over a patient’s hospital course to evaluate for mental status assessment in both traumatic and nontraumatic presentations. The GCS can indicate the level of critical illness. Trauma patients presenting with a GCS score < 15 warrant close attention and reassessment. A declining GCS score is concerning in any setting, and should prompt airway assessment and possible intervention. Conversely, a GCS score of 15 should not be taken as an indication that a patient (trauma or medical) is not critically ill. Decisions about the aggressiveness of management and treatment plans should be made based on clinical presentation and context, and should not be overridden in any way by the GCS score. Clinical management decisions should not be based solely on the GCS score in the acute setting. If a trauma patient has a GCS score < 8 and there is clinical concern that the patient is unable to protect his or her airway or there is an expected worsening clinical course based on examination or imaging findings, then intubation can be considered. In any patient, a rapidly declining or waxing and waning GCS score is concerning and intubation should be considered in the context of the patient's overall clinical picture. Abbreviation: GCS, Glasgow Coma Scale. Although it has been adopted widely and in a variety of settings, the GCS score is not intended for quantitative use. Clinical management decisions should not be based solely on the GCS score in the acute setting. The modified Glasgow coma scale (modified GCS) is a 15-point scale that has been widely adopted, including by the original unit in Glasgow, as opposed to the 14-point scale. The modified GCS was developed to be used in a repeated manner in the inpatient setting to assess and communicate changes in a patient's mental status and to measure the duration of coma (Teasdale 1974). In the acute care setting, the GCS has been shown to have highly variable reproducibility and interrater reliability (ie, 56% among neurosurgeons in 1 study, 38% among emergency department physicians in another study). In its most common usage, the 3 sections of the GCS are often combined to provide a summary of severity. The authors themselves have explicitly objected to the score being used in this way, and analysis has shown that patients with the same total score can have huge variations in outcomes, specifically mortality. A GCS score of 4 predicts a mortality rate of 48% if calculated 1 (eye) + 1 (verbal) + 2 (motor), and a mortality rate of 27% if calculated 1 (eye) + 2 (verbal) + 1 (motor), but a mortality rate of only 19% if calculated 2 (eye) + 1 (verbal) + 1 (motor) (Healey 2014). Copyright © MDCalc • Reprinted with permission. 4 AMA PRA Category 1 Credits™, 4 ACEP Category I Credits, 4 AAFP Prescribed Credits, 4 AOA Category 2-A or 2-B Credits. Describe potential methods for early sepsis recognition in a patient presenting with signs and symptoms of infection. 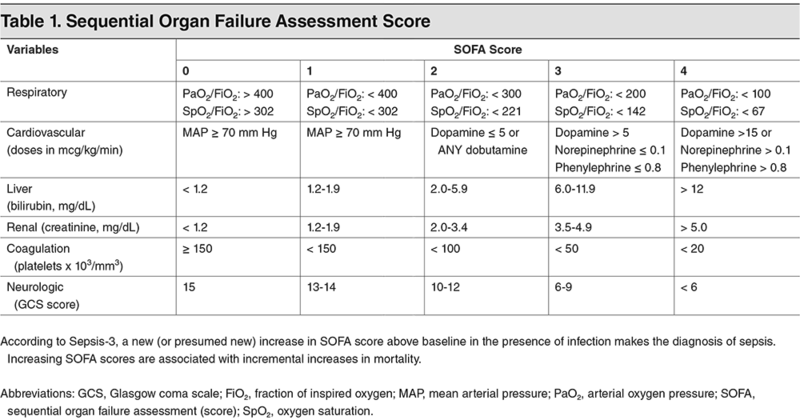 List the elements of the sequential (sepsis-related) organ failure assessment score and its utility in clinical practice. Provide specific recommendations for early management of severe sepsis and septic shock. Explain the implications of national quality metrics for sepsis care. Date of Original Release: October 1, 2018. Date of most recent review: September 10, 2018. Termination date: October 1, 2021. Accreditation: EB Medicine is accredited by the Accreditation Council for Continuing Medical Education (ACCME) to provide continuing medical education for physicians. This activity has been planned and implemented in accordance with the accreditation requirements and policies of the ACCME. Credit Designation: EB Medicine designates this enduring material for a maximum of 4 AMA PRA Category 1 Credits™. Physicians should claim only the credit commensurate with the extent of their participation in the activity. ACEP Accreditation: Emergency Medicine Practice is approved by the American College of Emergency Physicians for 48 hours of ACEP Category I credit per annual subscription. AAFP Accreditation: This Enduring Material activity, Emergency Medicine Practice, has been reviewed and is acceptable for credit by the American Academy of Family Physicians. Term of approval begins 07/01/2018. Term of approval is for one year from this date. Physicians should claim only the credit commensurate with the extent of their participation in the activity. Approved for 4 AAFP Prescribed credits. AOA Accreditation: Emergency Medicine Practice is eligible for up to 48 American Osteopathic Association Category 2-A or 2-B credit hours per year. Specialty CME: Included as part of the 4 credits, this CME activity is eligible for 2 Pharmacology CME credits, subject to your state and institutional approval. Needs Assessment: The need for this educational activity was determined by a survey of medical staff, including the editorial board of this publication; review of morbidity and mortality data from the CDC, AHA, NCHS, and ACEP; and evaluation of prior activities for emergency physicians. Target Audience: This enduring material is designed for emergency medicine physicians, physician assistants, nurse practitioners, and residents. Goals: Upon completion of this activity, you should be able to: (1) demonstrate medical decision-making based on the strongest clinical evidence; (2) cost-effectively diagnose and treat the most critical presentations; and (3) describe the most common medicolegal pitfalls for each topic covered. Discussion of Investigational Information: As part of the journal, faculty may be presenting investigational information about pharmaceutical products that is outside Food and Drug Administration–approved labeling. Information presented as part of this activity is intended solely as continuing medical education and is not intended to promote off-label use of any pharmaceutical product. Faculty Disclosures: It is the policy of EB Medicine to ensure objectivity, balance, independence, transparency, and scientific rigor in all CME-sponsored educational activities. All faculty participating in the planning or implementation of a sponsored activity are expected to disclose to the audience any relevant financial relationships and to assist in resolving any conflict of interest that may arise from the relationship. In compliance with all ACCME Essentials, Standards, and Guidelines, all faculty for this CME activity were asked to complete a full disclosure statement.The information received is as follows: Dr. Guirgis, Dr. Black, Dr. DeVos, Dr. Allison, Dr. Rose, Dr. Steinberg, Dr. Mishler, Dr. Toscano, and their related parties report no significant financial interest or other relationship with the manufacturer(s) of any commercial product(s) discussed in this educational presentation. 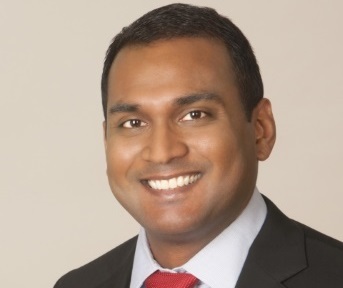 Dr. Jagoda made the following disclosures: Consultant, Daiichi Sankyo Inc; Consultant, Pfizer Inc; Consultant, Banyan Biomarkers Inc; Consulting fees, EB Medicine. Commercial Support: This issue of Emergency Medicine Practice did not receive any commercial support. Earning Credit: Two Convenient Methods: (1) Go online to www.ebmedicine.net/CME and click on the title of the article. (2) Mail or fax the CME Answer And Evaluation Form (included with your June and December issues) to EB Medicine. Hardware/Software Requirements: You will need a Macintosh or PC to access the online archived articles and CME testing. Additional Policies: For additional policies, including our statement of conflict of interest, source of funding, statement of informed consent, and statement of human and animal rights, visit www.ebmedicine.net/policies. Enter your email to get free evidence-based content delivered to your inbox once per month. Last Modified: 04/21/2019 © EB Medicine. All rights reserved.